This set of cards helps you to imagine and consider a journey from the moment of departure to the moment of arrival. These cards establish the story of the journey, and all the aspects of the the experience that may need ‘remedying’. They provide different ways of thinking about your journey, inspired by the results of the ethnographic research, and then help to identify potential items you might carry in a kit to ‘remedy’ your journey. You can download the full set of cards, and instructions for how to play the game below. You create the ‘Travel Remedy Kit’ itself from suggestions made through playing the card game. Each kit is tailored for each individual journey, to ‘remedy’ the experience and create a new experience of the journey. 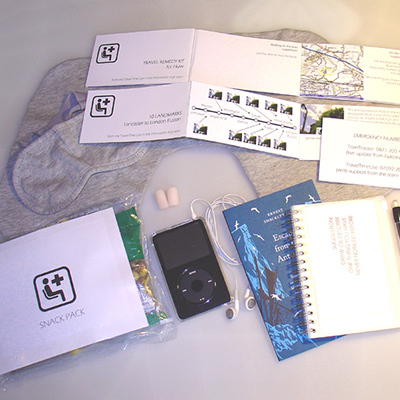 This is an example of a kit that was created for one of our research participants. Watts, L. and Lyons, G. (2010) Travel Remedy Kit: Interventions into Train Lines and Passenger Times, in Buscher, M. Urry, J. and Witchger, K. (eds.) Mobile Methods, London, Routledge.